Spring is finally here. Many people do spring cleaning. Why not consider an SEO check and spring cleaning of your website! If your website is not used for e-commerce, something you touch and work with every day, it is easy to let the maintenance and updates fall behind. 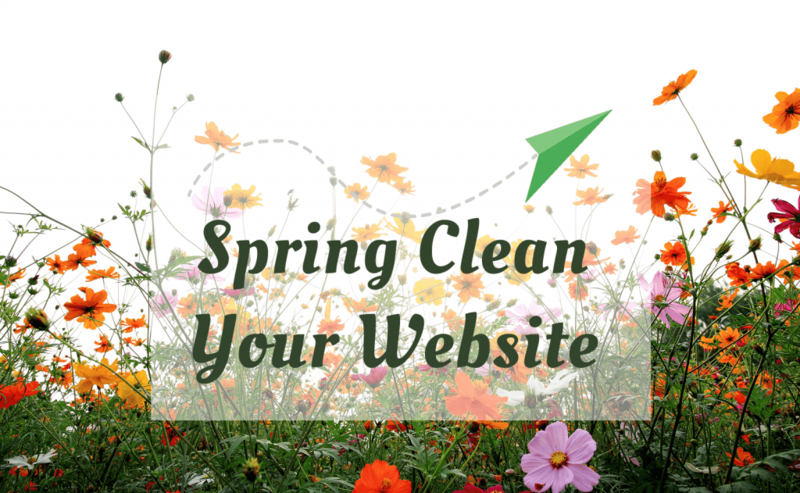 Let’s begin your spring cleaning website audit. brand at one time. But does it still? Do you have new products or services? New business hours? Are some of your offerings outdated? It is smart to enlist the help of friends and family. Getting an outside opinion can be extremely helpful. You should also look at your contact information. Are all the email addresses and contact forms still accurate? Have there been employment changes that are not reflected on the site? It goes without saying that anything outdated should be updated. This goes for copy, images, products and services, and testimonials. Your website should be a current representation of your business and brand. Here’s a tip! While you’re checking the contact information on your site, make sure it matches your contact information on social media! No SEO check is complete without at least checking social media pages. Make the Ask: Calls to action (CTAs) are an important, and often overlooked, aspect of a website. Check for them during your spring website audit. Tell users what you want them to do, and ensure that this ask is clearly visible on the site. This is not to say that you should annoy your visitors with constant popups and annoying graphics. Calls to action should accent your brand. Links: As you’re looking over your content, perform a link audit. This is a crucial step in an SEO check. Broken links can decrease your search engine optimization and turn customers away. This task might seem time consuming. If you don’t want to do it yourself, CourseVector performs a link audit as a part of our free SEO analysis. Remember, it is important that both internal and external links are working. Site Structure: Menu organization is another item that affects both the user experience and your find-ability. This can be a daunting task. But it is important that your users can easily navigate your website via your menu to find the information for which they are looking. Likewise, can search engines easily crawl you site? Is all your content visible? Mobile audit: Mobile technology is ever changing. A mobile website audit will show you how your website displays on the multitude of different mobile screens available. Not only will this give the best possible user experience, but it will also give the best possible SEO results. Search engines recognize that people search on mobile. Your site must be mobile friendly, or you could be penalized in search results. Behind the Scenes: You’ve put a lot of work into making your website neat, tidy, and accurate. But, what goes on behind the scenes is almost as important as what your customers see. WordPress publishes updates periodically to ensure usability and security. These updates do not happen automatically. It is your job to update your WordPress installation. Likewise, many plugins have updates that must be manually installed. Spring is the perfect time to ensure that you are using the latest, most security versions of WordPress and plugins. Here’s a tip! Back up your website before you install any updates! If maintenance is not your thing, consider managed WordPress hosting. Let the pros handle the maintenance. CourseVector offers a free SEO and website audit. They check for broken links and images, calls to action, mobile compatibility, user experience, and more!